Israeli troops shot dead one Palestinian and wounded at least 220 others at protests along the Gaza border on Friday, Gaza health officials said, as diplomats sought to secure a ceasefire deal. 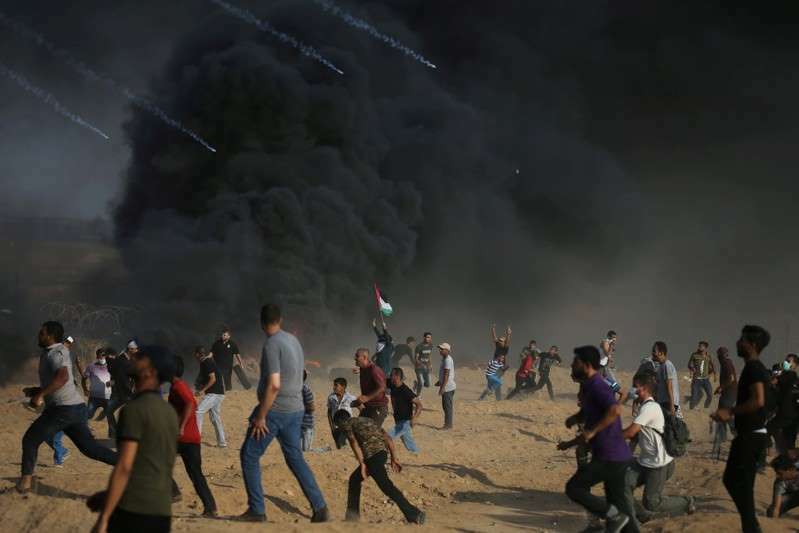 The Israeli army said around 8,000 Gazans participated in the protests at five locations along the border on Friday and that some broke through the border fence and attacked troops with firebombs and an explosive device. A Gaza hospital official said a 25-year-old man had been shot dead and that of the some 220 people wounded, 90 suffered wounds as a result of live fire. Organisers have said they will continue the weekly Friday protests, at which 156 Palestinians and one Israeli soldier have been killed since they began four months ago, until Israel lifts its economic blockade of the Gaza Strip. [post_ads]On Wednesday Israel stopped shipments of fuel and gas to Gaza, saying the move was in response to the continuation of cross-border violence, despite assurances from Egypt that it would end. Tensions around the protests have escalated since the weekly Friday protests began on March 30, resulting in some of the worst fighting between Israel and Palestinian militants in since the 2014 Gaza war. Israel has lost tracts of farmland and forests to fires set by kites and helium balloons laden with incendiary material and flown over from Gaza, on a daily basis during the scorching summer months. The Israeli army also said one of its tanks shelled a military post belonging to Hamas militants in the Gaza Strip. There were no reports of casualties in that incident. Israeli Prime Minister Benjamin Netanyahu, who canceled a trip to Colombia next week, is due to convene his security cabinet on Sunday to discuss an emerging deal, brokered by the United Nations and Egypt, for a long-term truce in Gaza, Israel media has reported. Israeli media said Israel is seeking a long-term commitment from Hamas to end the protests and halt the launch of the incendiary balloons and kites in exchange for lifting restrictions on the passage of goods and travel for Gaza. More than two million Palestinians are packed into the narrow coastal enclave, which gets most of its fuel and gas from Israel and already suffers up to 20 hours of power cuts per day due to shortages. The protests in Gaza come as its economic hardship deepens and prospects remain remote. Israeli-Palestinian peace talks have been frozen since 2014. Israel withdrew its troops and settlers from Gaza in 2005, but maintains tight control of its land and sea borders, citing security concerns over Hamas and other militant groups.